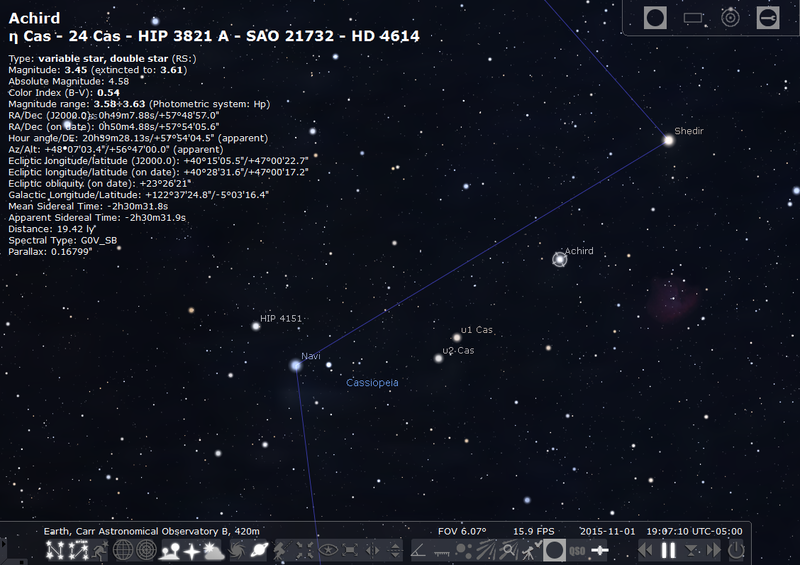 Yesterday morning I learned there was a new version of Stellarium out. I downloaded version 0.14.0 for Windows to try it out. The first thing I noticed was that I could not see the mouse pointer! The software was working, that is I could click on an object (blind) and get the info. Or move to the bottom-left corner of the screen to see the menus pop up. Happily, when I switched out of full screen mode, the Windows 10 arrow appeared and everything worked normally. That's a little irksome but it probably a video driver issue and nothing with the app proper. The next thing I noticed was meteor shower radiants! Very neat. Easily toggled on or off with the button in the bottom toolbar or the keyboard shortcut Ctrl-Shift-m. The labels can be toggled independently with Shift-m. Very good information is noted upon clicking or selecting a radiant. Most impressive: they move over time, as per drift! Someone really did their homework. A great improvement. There are some pretty dramatic changes with respect to deep sky objects or DSO targets. In the View window/dialog, there's a new tab called DSO. It allows objects to be displayed from a variety of additional catalogs, which speaks volumes. In addition to Messier, NGC, and IC, we now can view objects from the PGC, UGC, Collinder, Caldwell, Melotte, Sharpless, and Van den Bergh lists, to name a few. Also on the dialog is the ability to filter by type. Correspondingly, the Search tool is enhanced to recognise (internally) the short codes, like Cr or Mel. A very welcome change. Perhaps it was deployed in the preceding version but I don't remember seeing the different types of DSOs shown with indicators in different colours. Regardless, we have dotted yellow circles for open clusters, green squares for nebulae and molecular clouds, grey squares for dark nebulae, galaxies in red ovals, and so on. Handy. There appear to be better (on-board) catalogs for stars too! In addition to given name, Bayer, Flamsteed, and HIP number, we see HD and SAO. All listed together. It also seems there is a slightly better notation for double stars. 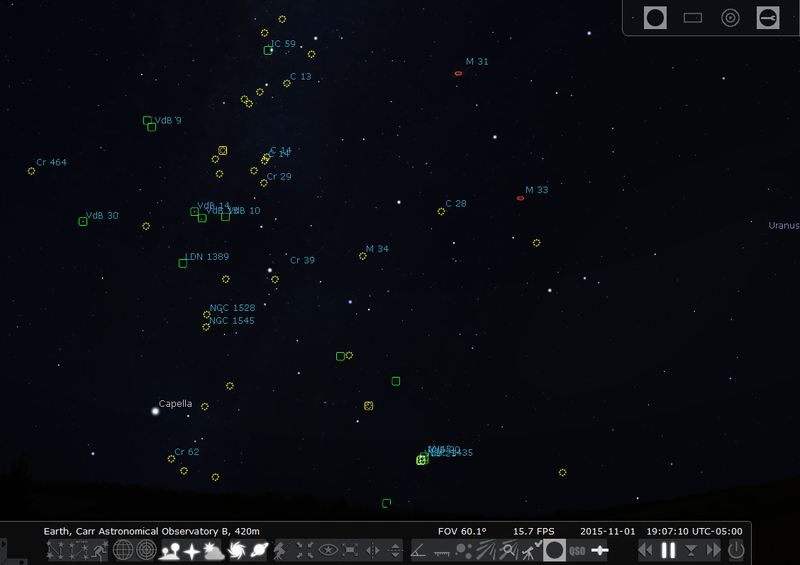 These two improvements, better DSO handling and more DSO and stellar catalogs, signals a significant notch up in the maturity of Stellarium. I noted a small change in the satellite plug-in. Satellites are now shown, by default, as moving points. The orbit lines can be turned on, still, but now the appearance is surprising realistic. 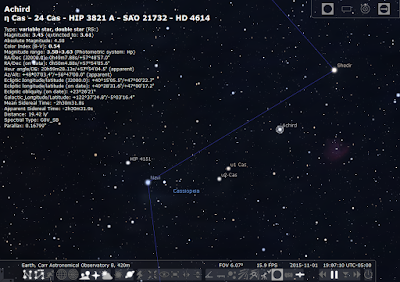 Which has always been Stellarium's forte. 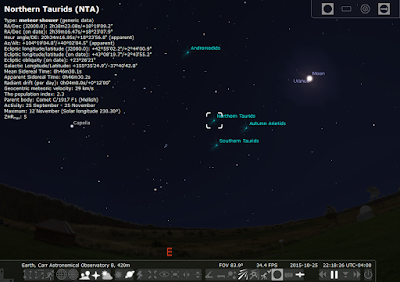 There are still a number of features I have yet to test, like 3D sceneries, where you can move about your landscape, so to check or predict alignments or occultations with structures. 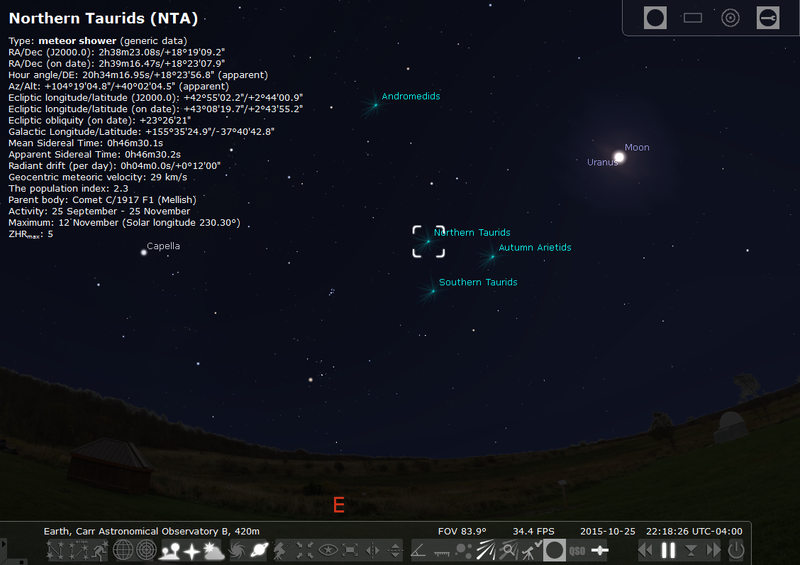 Stellarium still has some gotchas and minor annoyances. For example, I don't know if something has changed but took me a heck of a time to set a custom location. The direct entry of latitude and longitude didn't seem to work; I had to use the spinners. Also, when the Search dialog appears, often the application focus is still on the sky in the background. So characters typed will not go into the Search field and will quite likely change your screen settings. In the course of testing the software, I found that a few keyboard shortcuts had changed. And I learned some new ones for new features. Made a note to update my list... A few window/dialogs had changed, a few features or controls were now in different places, like the Flip Scene buttons. 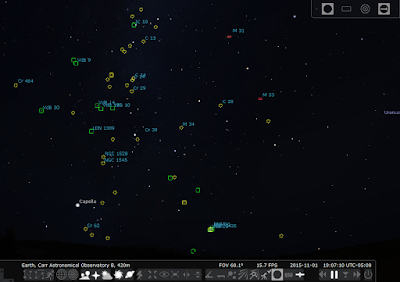 Overall, version 0.14.0 represents a very nice upgrade to the Stellarium planetarium software.